The US Government shutdown delayed the release of the December GHCN station data. This also, perhaps surprisingly, also delayed the the Met Office/CRU results. So just how independent are they one from each other? Here is a comparison of the annual results from Berkeley Earth, GIStemp, my own 3d-GHCN, 3D-H4 and HadCRUT4.6, all on the same baseline of 1961-1990. You can see that they all have the same shape but that they then begin to diverge after 2004. Why? GHCN V3 has 7280 valid stations and CRU have 7688 the vast majority of which use the same data, hence the reason for the delay in also releasing CRUTEM . The ocean surface data are also interdependent between HADSST3 and ERSST3, with only marginal differences. So what causes these apparent changes in results and trends ? The basic difference is simply the way the surface weighted average is made. HadCRUT only average temperatures over locations where there are measurements based on a 5×5 lat,lon grid. The area weighted average of each cell is cos(Lat). This method has remained constant since 1990. You can argue that this is the only impartial choice since it avoids any interpolation. 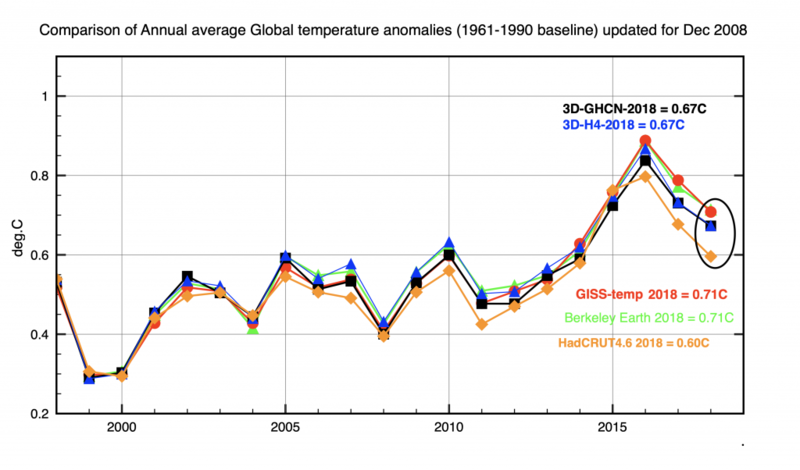 GISSTemp results in the steepest temperature rise because it assumes that every station is representative of temperature change within a 1200km radius. 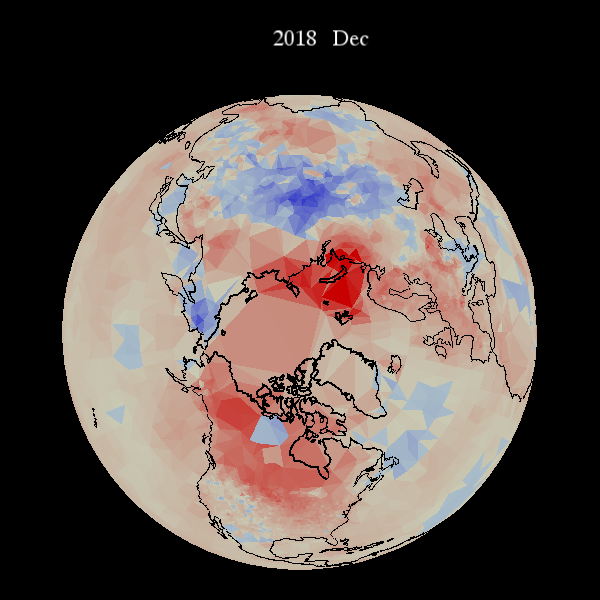 So the addition of new ‘rapidly’ warming stations in regions like the the Arctic have a far larger effect over adjacent regions when forming the average. My gut feeling is this method, originated by James Hansen has a warming biased. Berkeley Earth uses a least squares fitting technique based on an assumption that Temperature is a smooth function of position over the earth’s surface. So they also extrapolate into areas without data. Cowtan & Way use a kriging technique on the raw HadCRUT4 data, essentially doing the same thing. I use spherical triangulation of all station and ocean data over the surface of the sphere to cover all the earth’s surface. Each triangle has one measurement at each vertex and all the earth’s surface is covered. Nick Stokes uses a similar technique for TempLS. Here is a comparison between the monthly temperature anomalies of HadCrut4 and GHCN V3 when calculated exactly the same way using Spherical Triangulation. Only about 5% of stations are different, but there remains a small difference in data corrections (homogenisation). HadCRUT4.6 uses 7688 stations and GHCN has 7280. Almost exact agreement between HadCUT4.6 and GHCNV3 when calculated exactly the same way. The new GHCN V4 provisional data has collected 27315 stations of which 17372 have at least 10y of data between 1961-1990, so eventually V4 should double the number of stations, although not dramatically increasing the geographic coverage. 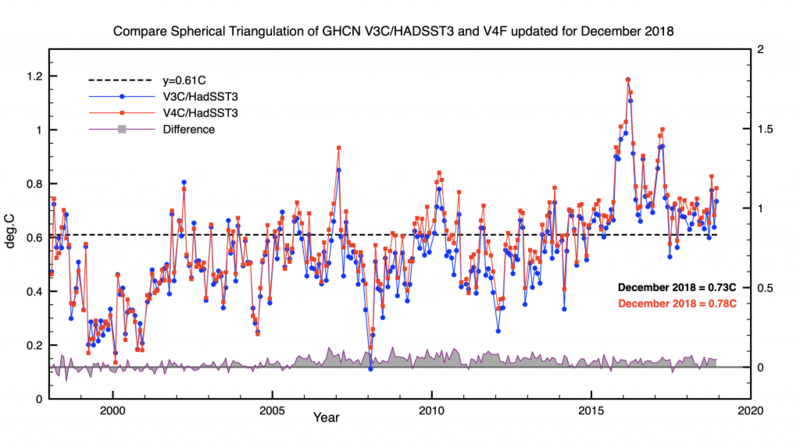 We can expect a bit of extra warming though since Arctic latitudes have yet more data. Here is a preview. With so many new stations mainly in the Northern regions global temperatures will apparently ‘warm again’ once the main groups adopt it. Comparison of GHCN V3 (blue) and V4 (red) calculated in exactly the same way. Deltas are shown against the right hand y-axis. 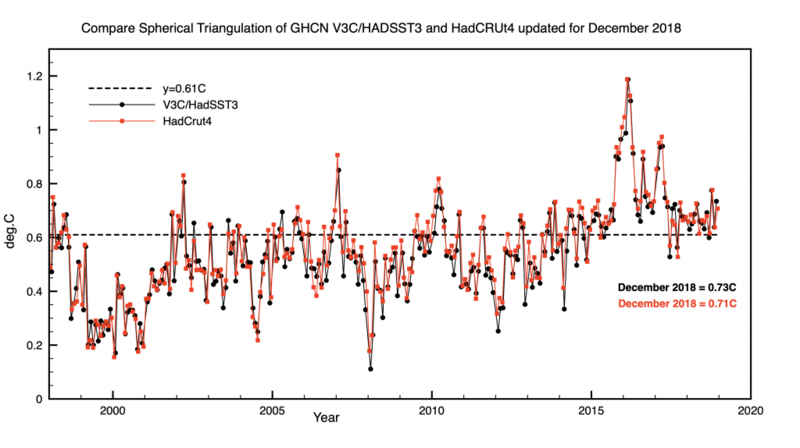 The December temperature rises by another ~0.05C above that of GHCN V3. In conclusions all global temperature indices agree with each other in general, but that is mainly because they all use the same core station and ocean data. The main differences are due to how they spatially average the available data. HadCRUT4.6 is the most conservative because it only averages over (Lat, Lon) cells where there is real data. All the others extrapolate into regions without data. I think Spherical triangulation is the most honest because it works on the surface of a sphere, weighting each measurement equally. This entry was posted in AGW, Climate Change, climate science, NASA, NOAA, UK Met Office and tagged global warming. Bookmark the permalink. You can. But nothing avoids interpolation. We have only a finite number of thermometers. Everything between is interpolated. For HADCRUT, the interior land of a grid cell is interpolated from the average of thermometers in the cell. If there are none, it is interpolated from … the global average. Or for HADCRUT, from the hemisphere average. There are many ways you can interpolate better, and yes, mesh is good. Of course you are right Nick. The temperature within one 5 degree cell is assumed to be the average of the thermometers contained within it. I also assume that the temperature of a triangle is measured by the thermometers at each vertex. Some of those triangles can be very large ! However I think GISS take this to the extreme by allowing each station to have a radial influence over 1200km or an area of 4.5 Million Sq.km ! Colorado by comparison has an area of about 270,000 sq kilometers. One would be taking leave of common sense to believe one thermometer could be used to estimate an average temperature of Colorado. Which thermometer should be used? Vail, with its high mountain weather? Denver, with a growing urban heat island effect? West of the continental divide or East? I’ve noted wide variations in temperatures all over the state on a daily basis. How would I calculate a Colorado average on any given day? Would such an average temperature make any sense at all? For the umpteenth time, they don’t calculate an average temperature. Like Clive and all other sensible people they calculate an average temperature anomaly.